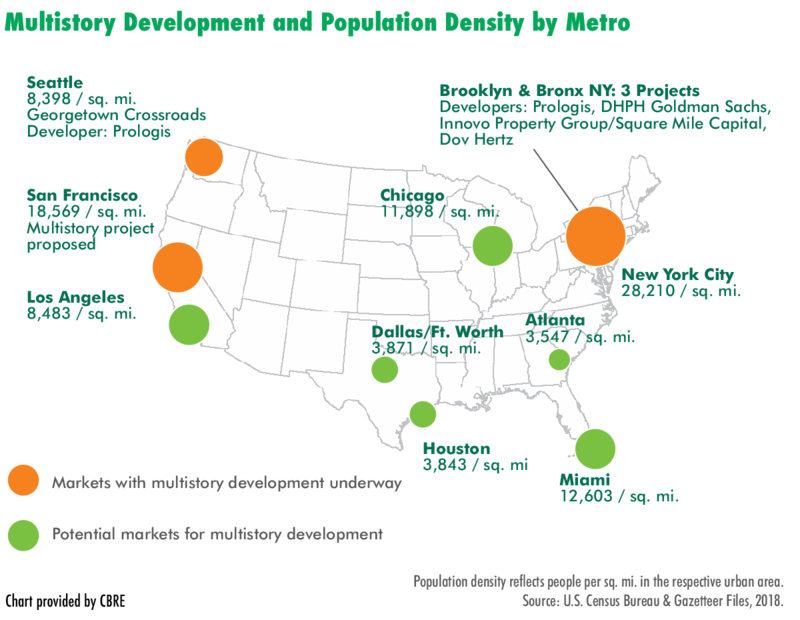 This CBRE chart shows current and potential areas for multistory warehouse development and the population density of each area. markets is inspiring developers to build a new wave of multistory warehouses, a report released today by real estate services and investment firm CBRE Group Inc. said. 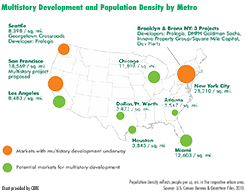 Distribution centers (DCs) with multiple stories are typically restricted to European and Asian markets, where industrial space is at a premium compared to sprawling U.S. cities. That rule of thumb still holds true, but a perfect storm of market conditions in the U.S. might make it possible for the phenomenon to reach this country as well in certain geographies, the firm found. CBRE is tracking the development of five multistory warehouses currently under construction, including three in New York City, one in San Francisco, and one recently completed in Seattle. The common threads in those projects are: a large, densely packed population; high industrial land prices and rents; and significant penetration of e-commerce use among residents, according to CBRE. Read the full article in DCVelocity.com here.